German construction company Max Bögl used six Potain tower cranes to help with the construction of a new bridge on the A3 main road near Limburg, Germany. The cranes were delivered by Max Bögl’s subsidiary company, Max Bögl Transport & Geräte. On site are three flat top Potain MDT 222 with tip heights up to 76.2 metres and operating radius up to 60 m. Two of them are mobile and one has been erected stationary, a spokesperson said. Also on site is a stationary Potain MD 150 with a tip height of 29.8 m and radius of 55 m, and a Potain MD 235 J12 with a tip height of 35.4 m and a radius of 54.8 m. A flat top Potain MDT 268A J12 with a tip height of 63.1 m and a radius of 60 m has also been erected and is being rented from Manitowoc’s fleet for 15 months. The construction of the new Lahn Valley Bridge also includes rerouting the freeway and installing a noise barrier. The new road is being built in both directions. Once the track towards Köln (Cologne) has been completed, the Potain cranes and auxiliary piers will be used to construct the second bridge’s superstructure. 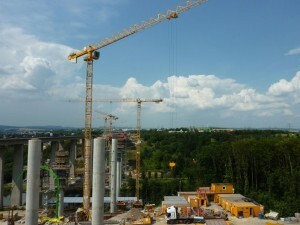 For the track towards Frankfurt, the cranes will be moved on to a rail system. The old Lahn Valley Bridge was built in 1964 and is about 400 m long and almost 60 m tall. It is used by more than 100,000 vehicles a day. Once the new bridge has been built, the old Lahn River Bridge will be demolished. Wow. That’s a huge construction can be seen here. Without a crane it is merely impossible to do such construction. Cranes really helps in reducing time consumption.